Algebra provides an introduction to variables such as x and y and square roots. Bring it down to earth with hands-on activities! Our collection gives your student a chance to practise algebra functions like working with variables, graphing lines, and balancing equations. Keep the connection between maths and the real world alive for your student. Want to try more activities for related maths skills, try our collection of Two digit numbers activities. Tic Tac Toe for Three Equations in a Row! 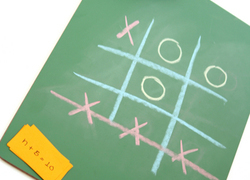 One way to "trick" your child into getting extra practise with one-step equations is to play a variation of the classic game, tic tac toe. 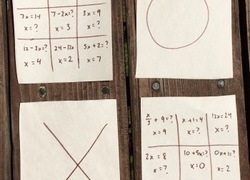 Try a new approach to working with variables and equations by playing this tic-tac-toe game with your maths student.